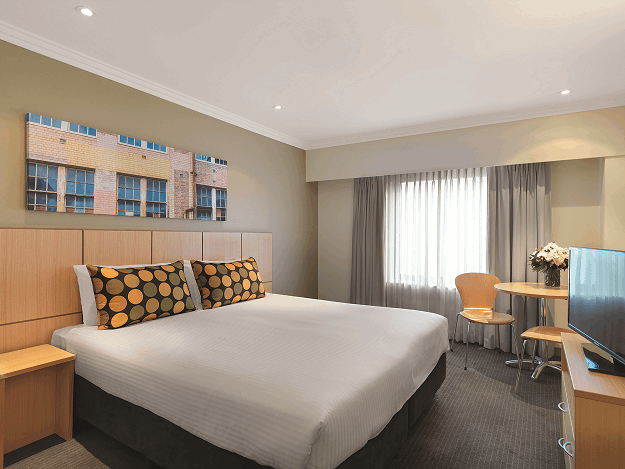 Situated on the edge of the CBD, Travelodge Sydney is perfectly positioned to explore Sydney. Superb restaurants, theatres, lively nightclubs and a great range of shops from designer stores to funky boutiques are within close walking distance. Opposite the Sydney Entertainment Centre. Close to all amenities and attractions such as Darling Harbour, Paddy's Market, The Latin Quarter, theatres, cinemas, shops and restaurants. Easy access to public transport including the monorail and light rail systems. Located in the heart of Sydney's Darling Harbour precinct, close to many attractions and activities. A short stroll from the hotel finds you in the midst of the many restaurants of Cockle Bay and Darling Harbour. The hotel offers a range of services and facilities including 24 hour reception. NOTE: Room is based on 2 Single Beds or 1 King Bed.